Review in a Nutshell: The Star-Touched Queen is a beautifully written slow-burn novel that will enchant you. The Star-Touched Queen follows Maya, who has been ostracized by her kingdom because of her ominous horoscope. She is swept away from the kingdom by Amar, a suitor her father had brought to potentially arrange a marriage. When she and Amar wed, she becomes the queen of Akaran. While being queen and married to Amar has benefits, there are secrets lurking in Akaran that Maya must unravel before it’s too late. Roshani Chokshi writes with beautiful, flowing language. From the first sentence alone I could tell I would adore this writing. It isn’t easy to simple. It can be a little confusing or unnecessary at times, but I still adored it. The world-building in this book is very interesting. It takes a lot from Indian mythology, but a lot of the mechanics of the world is left purposefully vague. You slowly unravel the truths as Maya does, which at times can be frustrating, but it makes for a captivating read and an amazing reread. The plot can be slow at times, especially around the middle of the book, but it makes up for it with the thrilling and dramatic scenes thrown in. This book is the perfect balance of alluring romance and fascinating mystery. Maya is an interesting protagonist. While she makes some stupid decisions, you still root for her and hope she gets a happy ending. Amar is an amazing love interest, and also a compelling character on his own. However, I have to admit, Gupta and Kamala were my favorite characters. They just added so much comic relief in an otherwise heavy book. 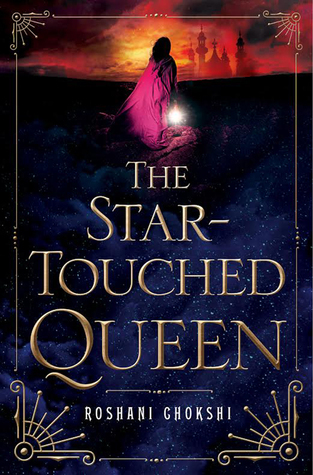 The Star-Touched Queen is a bewitching novel with radiant prose. You don’t want to miss this wonderful tale.